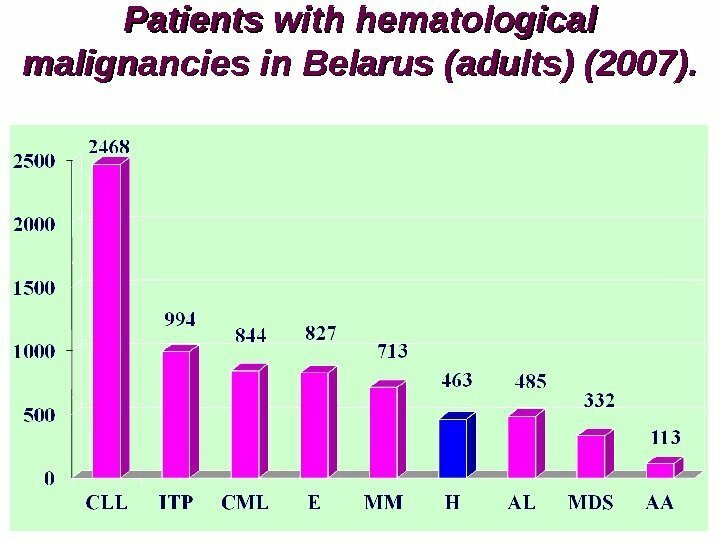 Patients with hematological malignancies in Belarus ( ( adults) (2007). 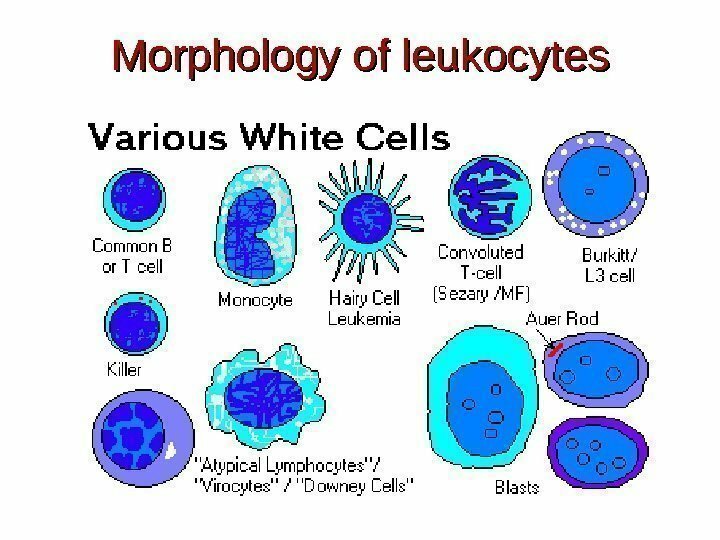 Acute leukemia. 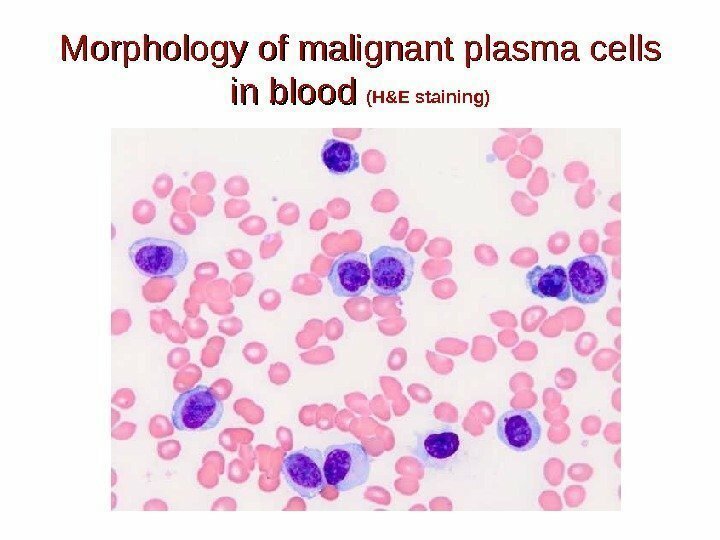 Originated from bone marrow (>25% blasts). 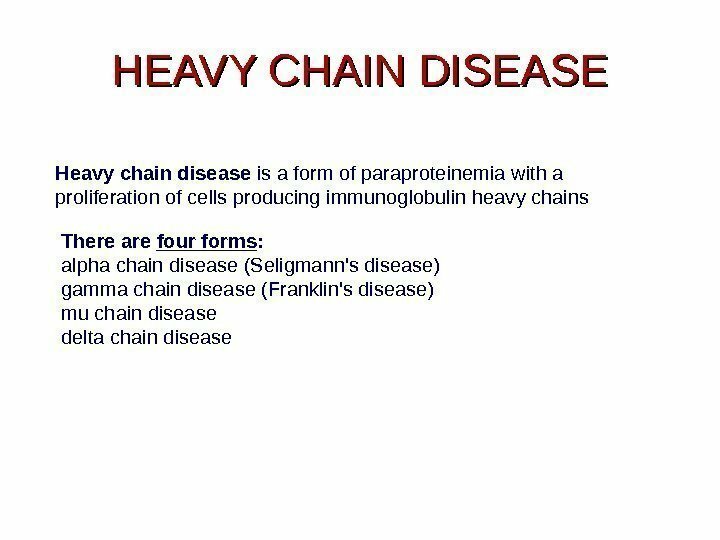 Usually monoclonal disease. Lineage committed morphology (FAB classif. ) 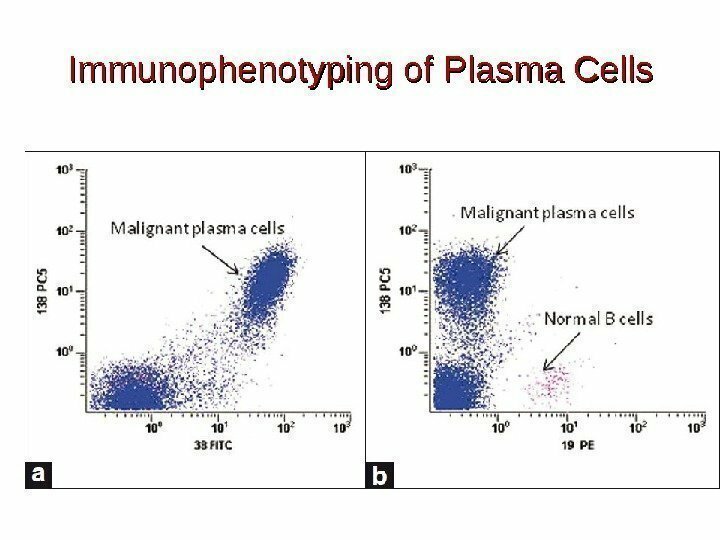 B and T or myeloid malignant cells are estimated by immunophenotyping (FAB classif. 1996 classif. ) 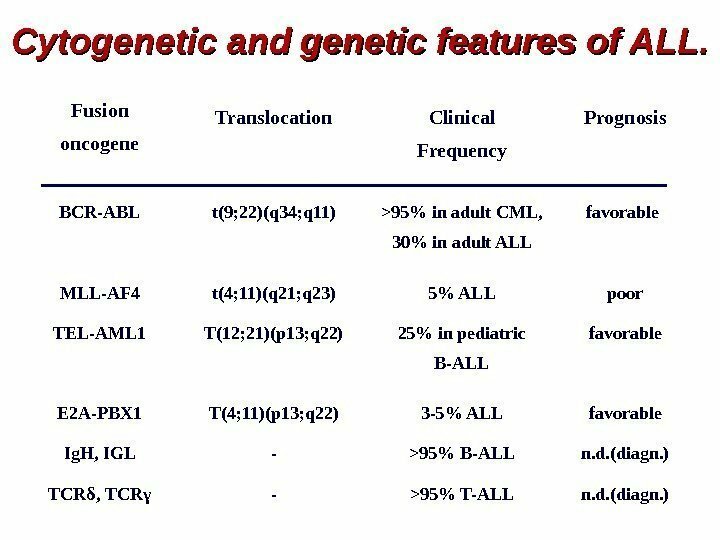 Cytogenetic abnormalities (WHO classif. 2001, 2008). 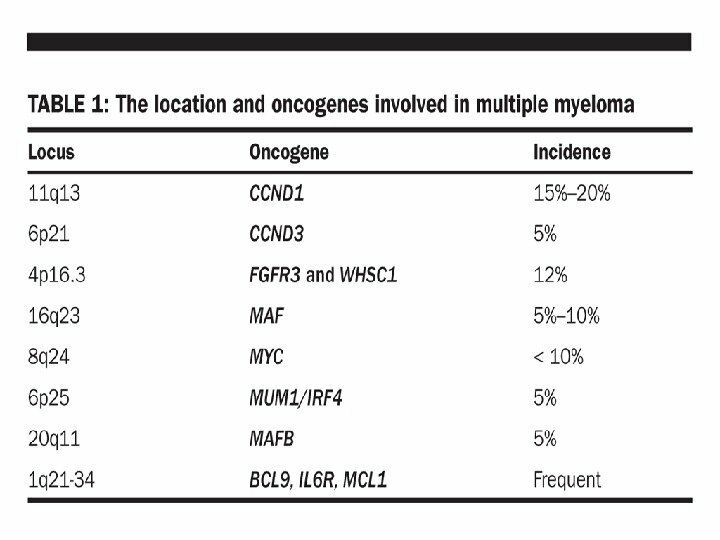 Fusion genes as markers of disease diagnosis and prognosis. 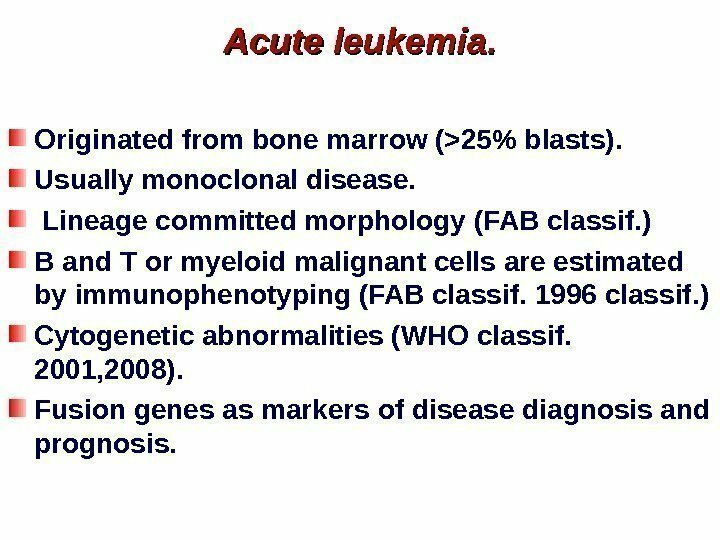 Acute leukemia (WHO classification, 2008). 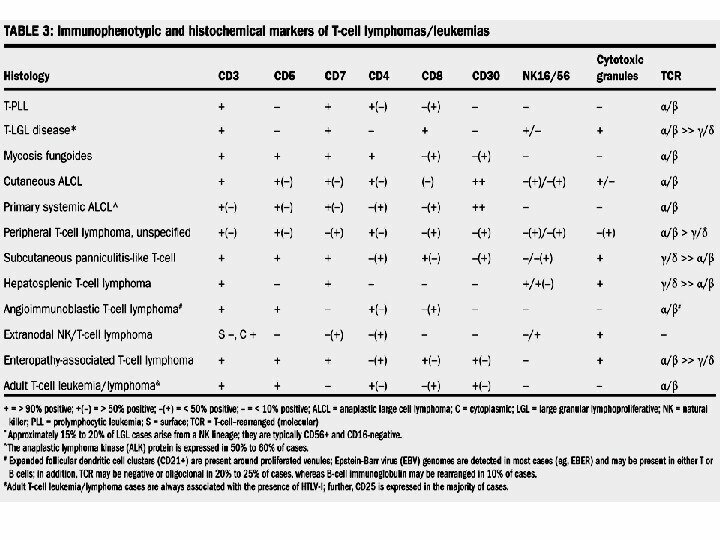 Mixed phenotype acute leukemia (T or B- myeloid, NK-cell…) B lymphoblastic leukemia/lymphoma with t(9: 22)(q 34; q 11. 2); BCR-ABL 1. 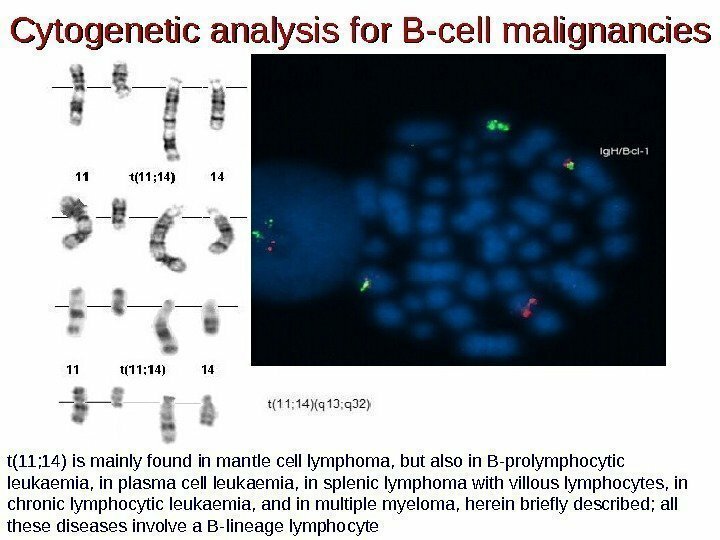 B lymphoblastic leukemia/lymphoma with t (v; 11 q 23); MLL rearranged. 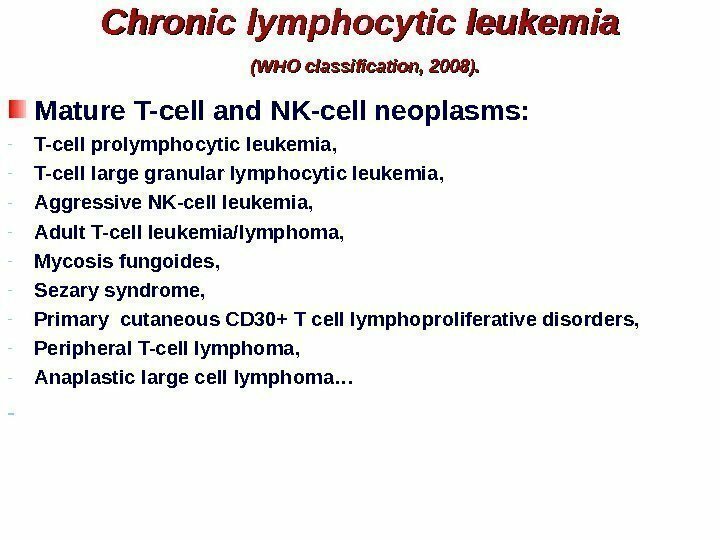 B lymphoblastic leukemia/lymphoma with t(12; 21)(p 13; q 22) TEL-AML 1 (ETV 6 -RUNX 1) B lymphoblastic leukemia/lymphoma with hyperdiploidy. 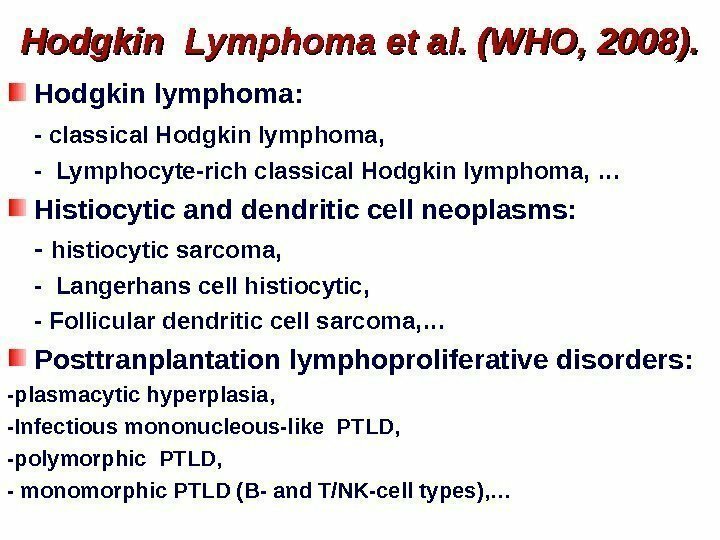 B lymphoblastic leukemia/lymphoma with hypodiploidy. 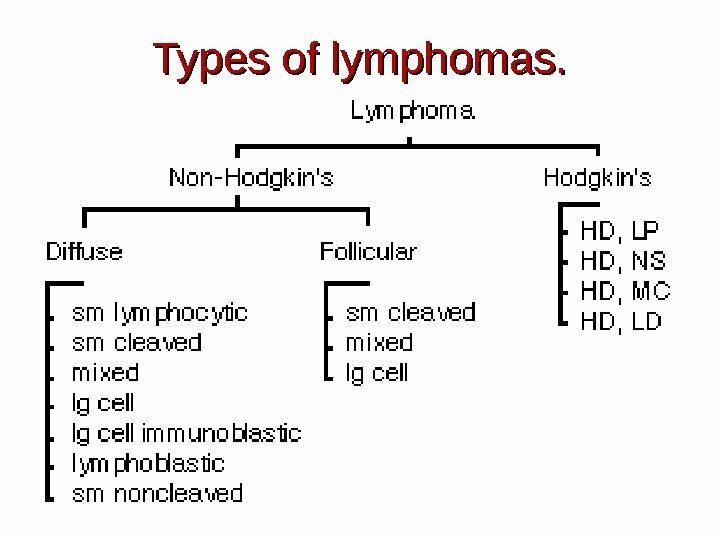 B lymphoblastic leukemia/lymphoma with t(5; 14)(q 31; q 32); IL-3 -Ig. 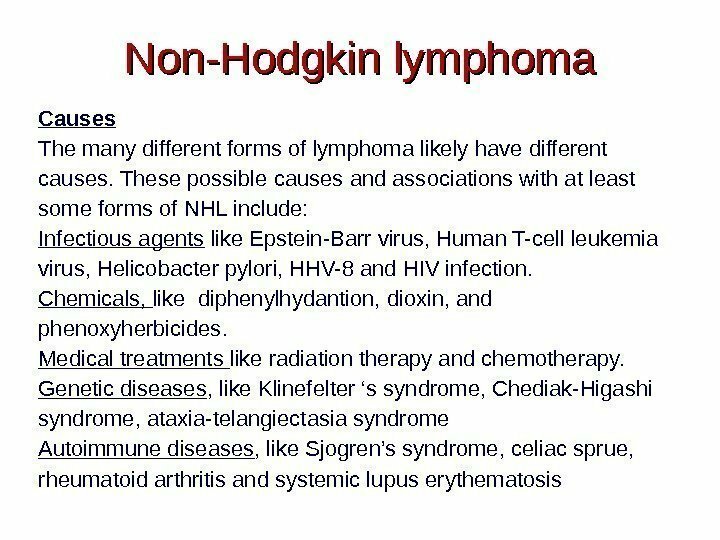 H B lymphoblastic leukemia/lymphoma with t (1; 19)(q 23; p 13. 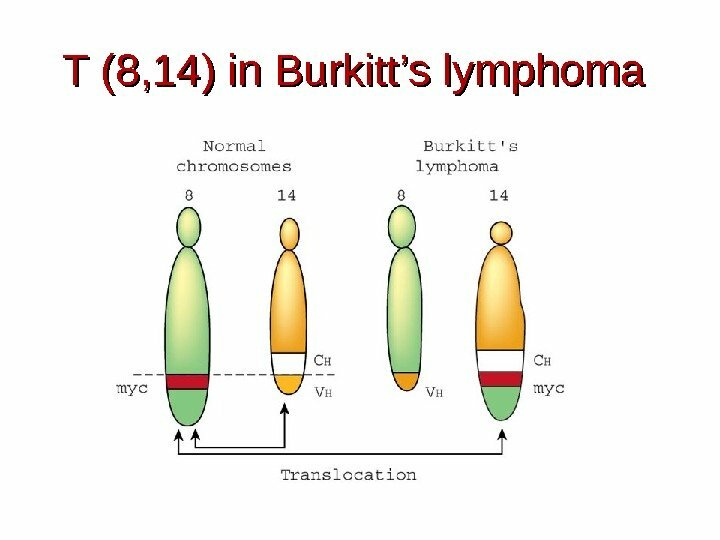 3); TCF-PBX 1 T lymphoblastic leukemia/lymphoma. 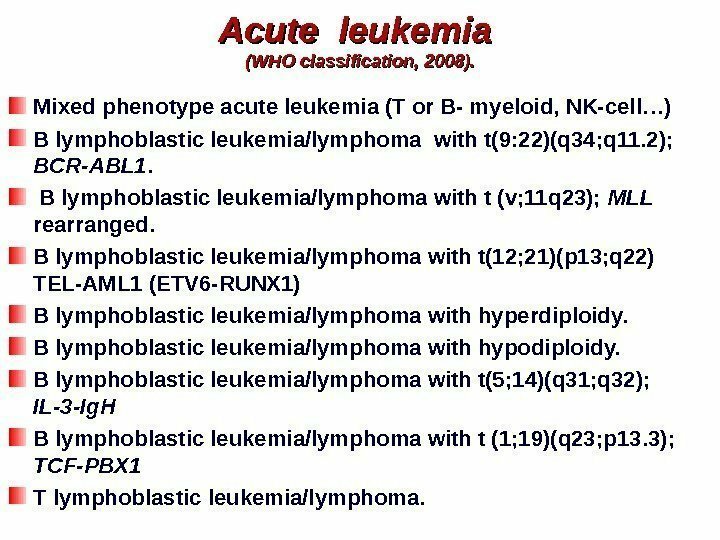 Chronic lymphocytic leukemia (WHO classification, 2008). 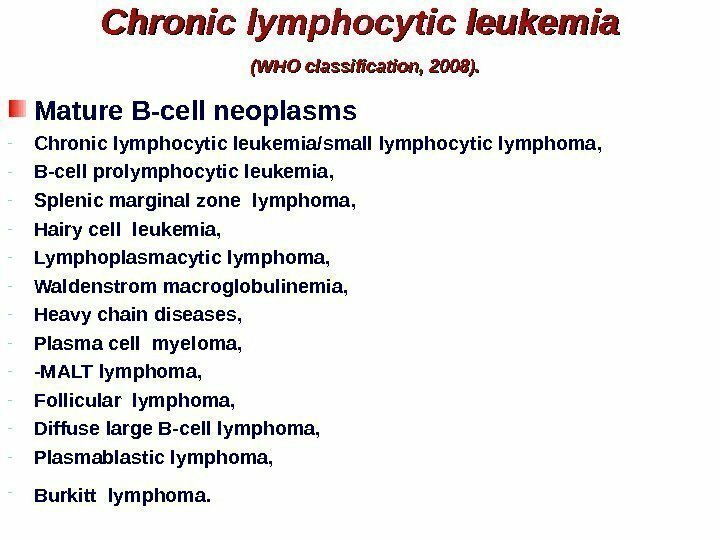 Mature B-cell neoplasms — Chronic lymphocytic leukemia/small lymphocytic lymphoma , — B-cell prolymphocytic leukemia , — Splenic marginal zone lymphoma , — Hairy cell leukemia, — Lymphoplasmacytic lymphoma, — Waldenstrom macroglobulinemia, — Heavy chain diseases, — Plasma cell myeloma, — -MALT lymphoma, — Follicular lymphoma, — Diffuse large B-cell lymphoma, — Plasmablastic lymphoma, — Burkitt lymphoma. 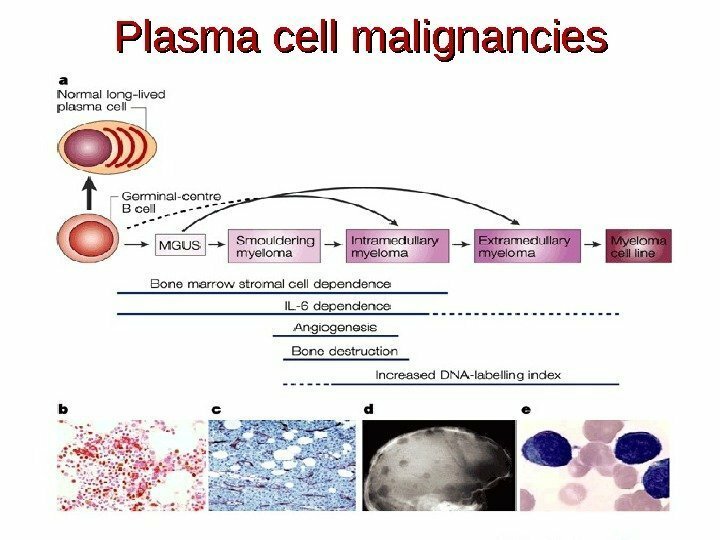 Adverse prognostic factors of CLL Diffuse infiltration of bone marrow by lymphocytes; Advanced age; Male gender; Deletions in chr. 17 p (p 53!) or 11 q (ATM !) 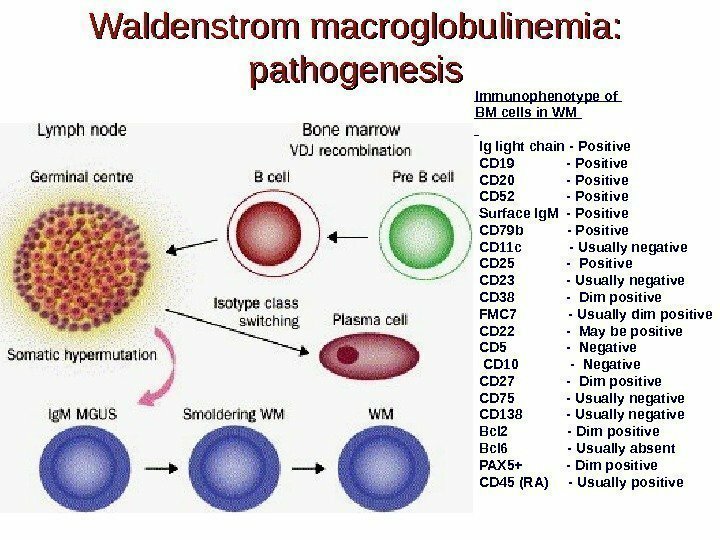 (5 -10% of pts for each) ; High serum level of beta-2 – microglobulin; Increased fraction of prolymphocytes in PB; >20% of ZAP-70 -positive cells, >30% CD 38+ cells; No rearangement in Ig. H V region. 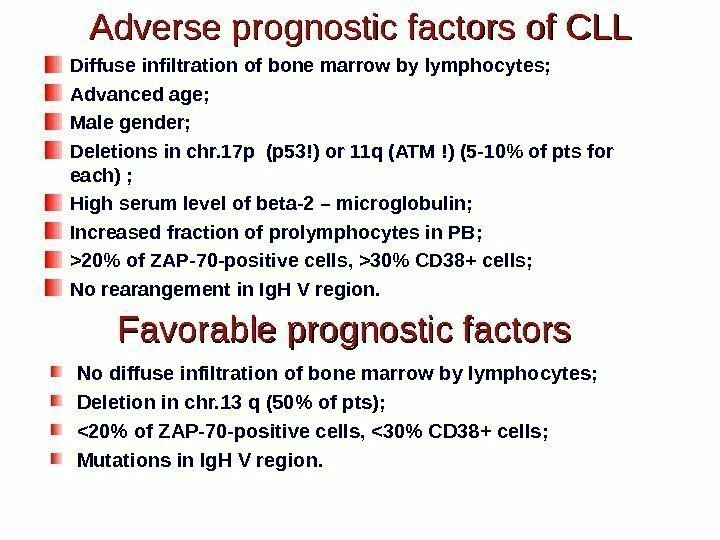 Favorable prognostic factors No diffuse infiltration of bone marrow by lymphocytes; Deletion in chr. 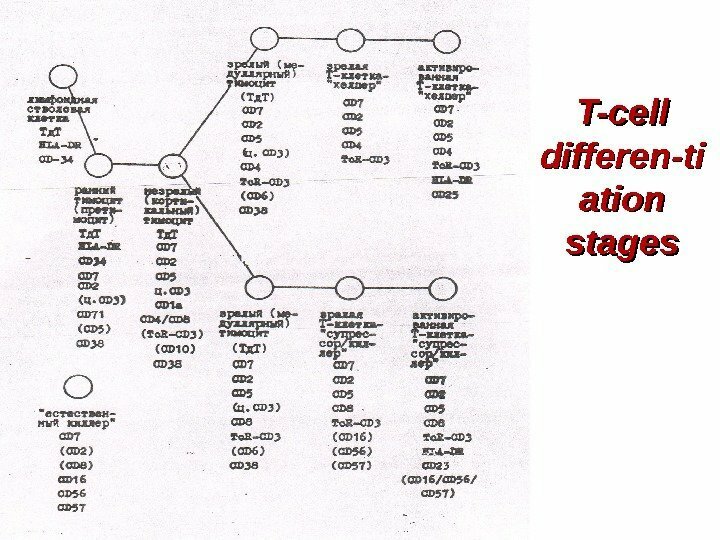 13 q (50% of pts); <20% of ZAP-70 -positive cells, <30% CD 38+ cells; Mutations in Ig. H V region. 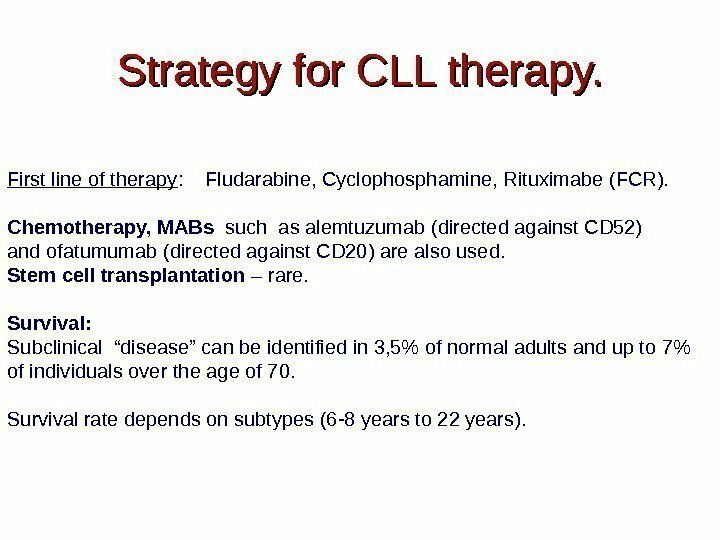 Strategy for CLL therapy. 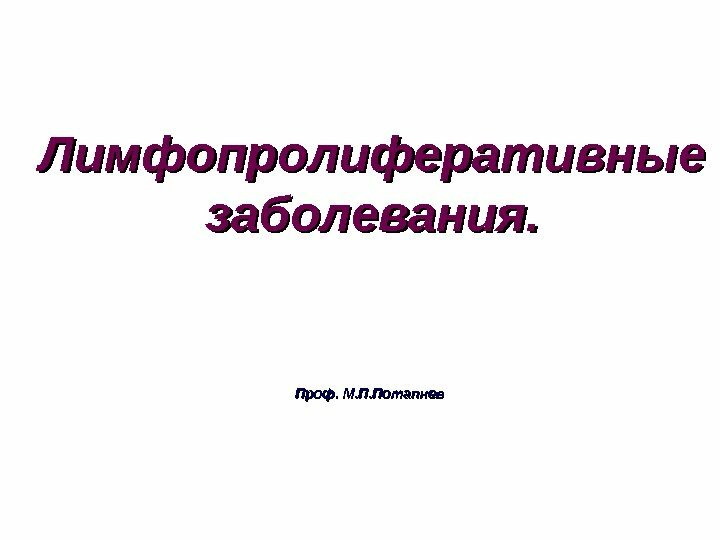 First line of therapy : Fludarabine, Cyclophosphamine, Rituximabe (FCR). 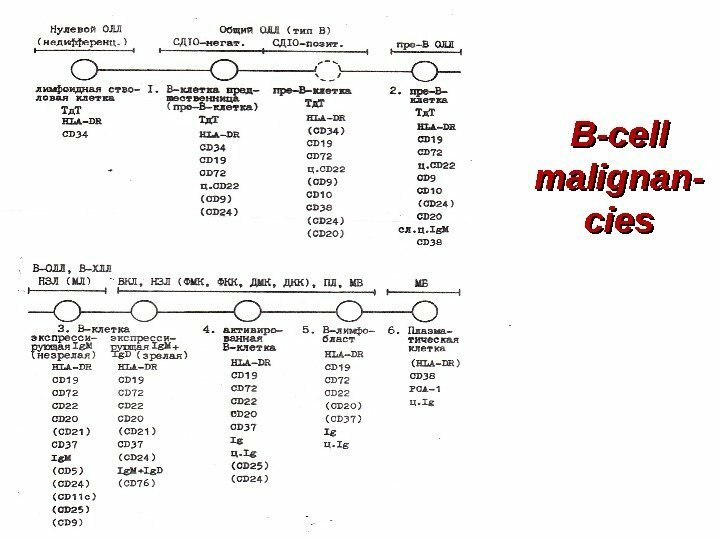 Chemotherapy, MABs such as alemtuzumab (directed against CD 52) and ofatumumab (directed against CD 20) are also used. 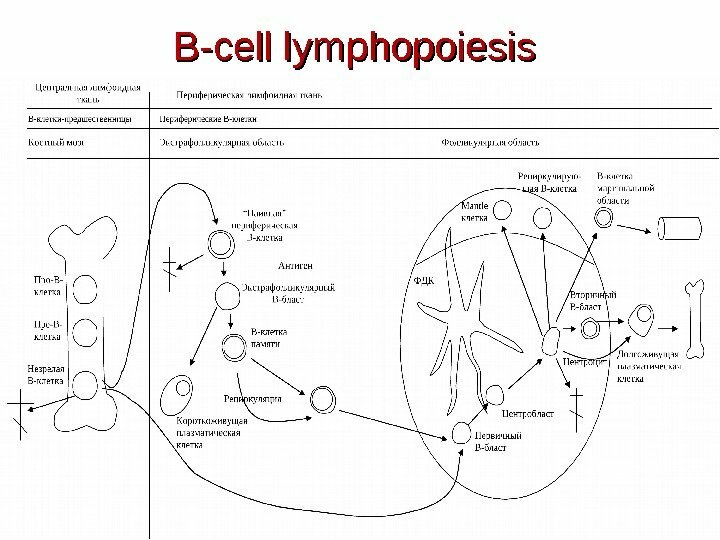 Stem cell transplantation – rare. 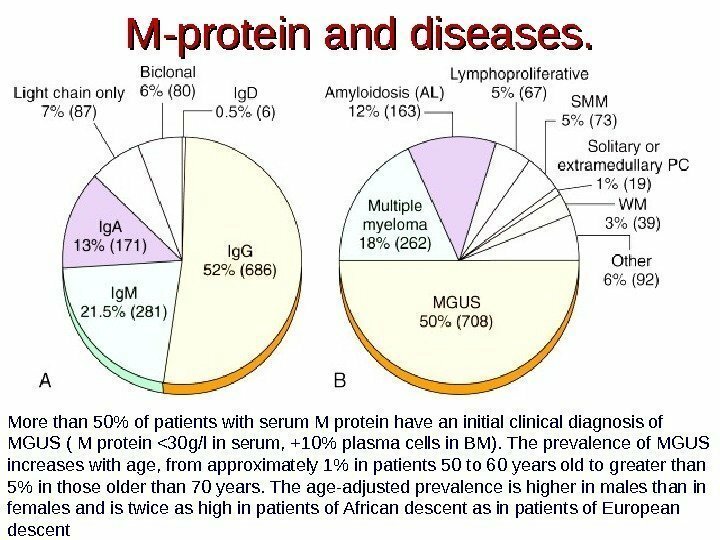 Survival: Subclinical “disease” can be identified in 3, 5% of normal adults and up to 7% of individuals over the age of 70. 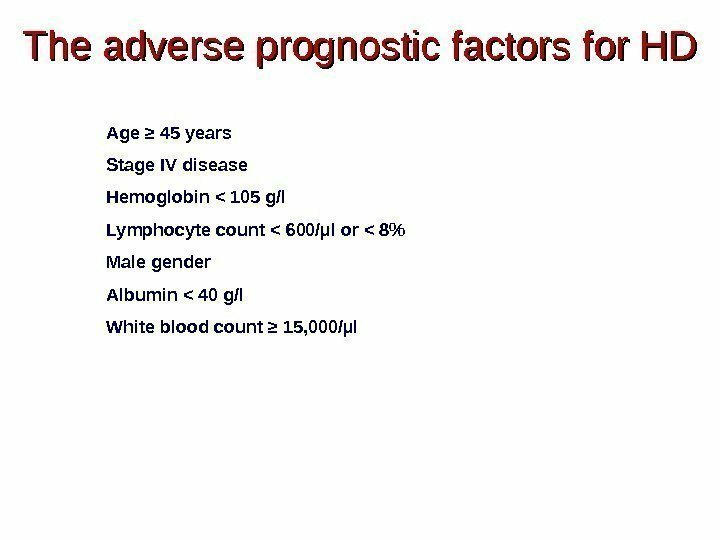 Survival rate depends on subtypes (6 -8 years to 22 years). 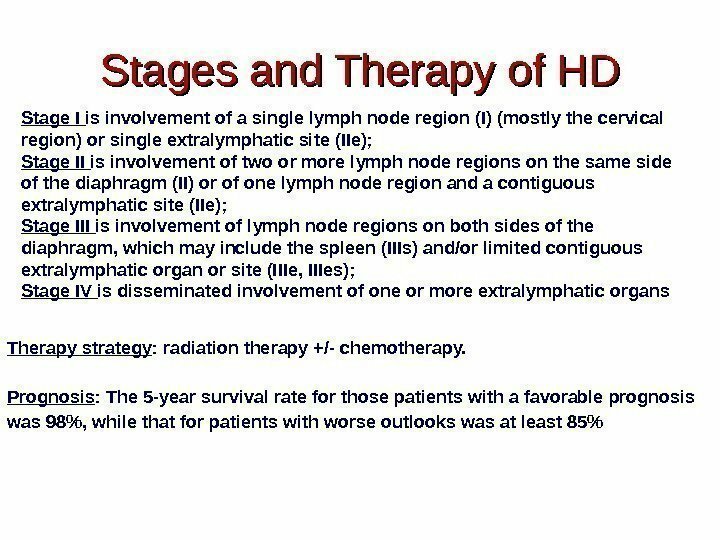 Histological diagnosis of HD. 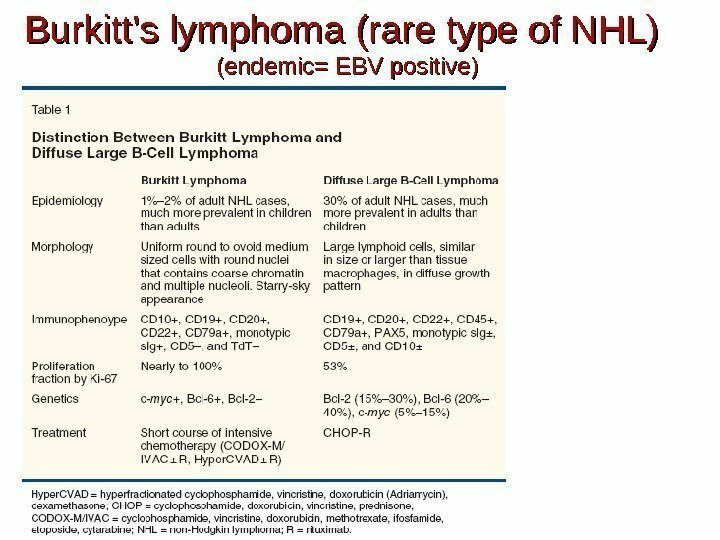 The Reed–Sternberg cells are identified as large often bi-nucleated cells with prominent nucleoli and an unusual CD 45 -, CD 30+, CD 15+/- immunophenotype. 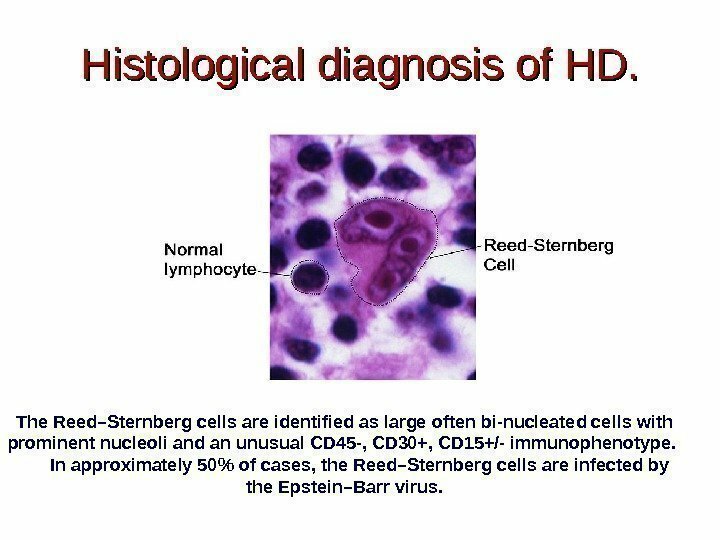 In approximately 50% of cases, the Reed–Sternberg cells are infected by the Epstein–Barr virus. 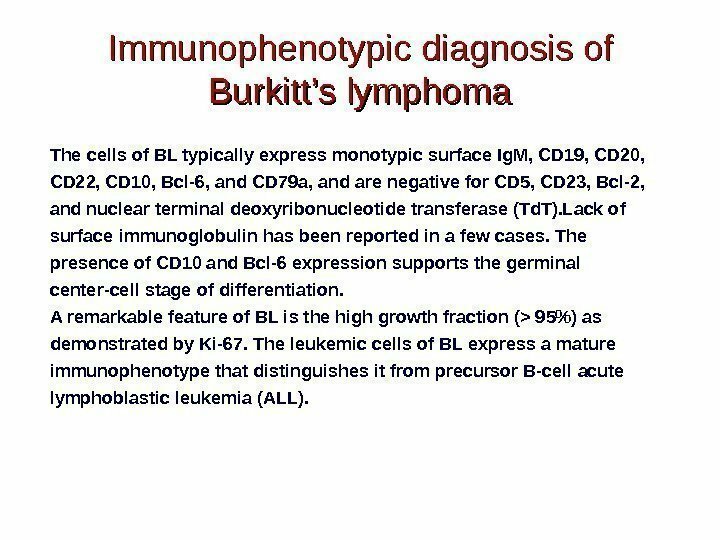 Immunophenotypic diagnosis of Burkitt’s lymphoma The cells of BL typically express monotypic surface Ig. 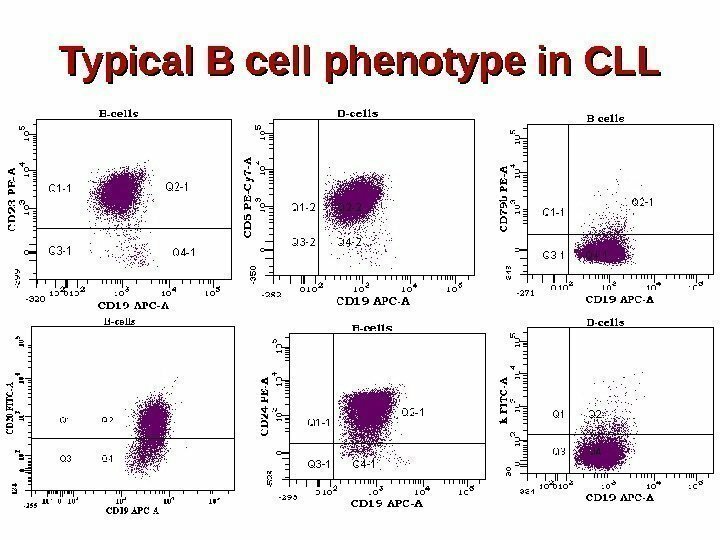 M, CD 19, CD 20, CD 22, CD 10, Bcl-6, and CD 79 a, and are negative for CD 5, CD 23, Bcl-2, and nuclear terminal deoxyribonucleotide transferase (Td. T). 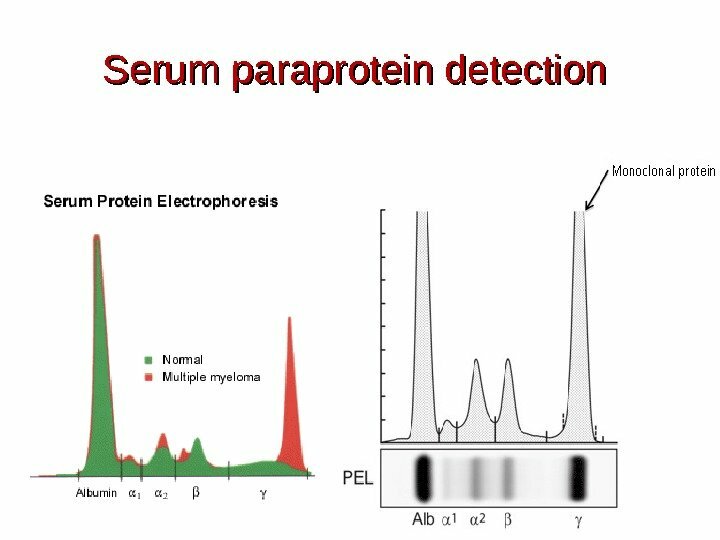 Lack of surface immunoglobulin has been reported in a few cases. 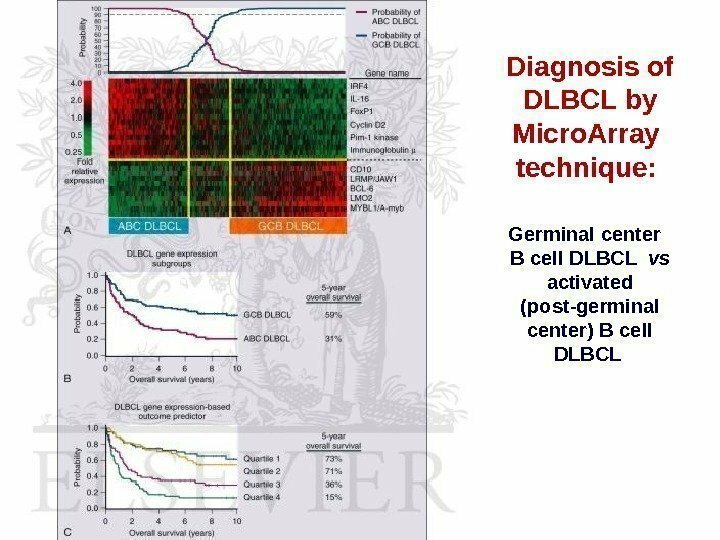 The presence of CD 10 and Bcl-6 expression supports the germinal center-cell stage of differentiation. A remarkable feature of BL is the high growth fraction (> 95%) as demonstrated by Ki-67. 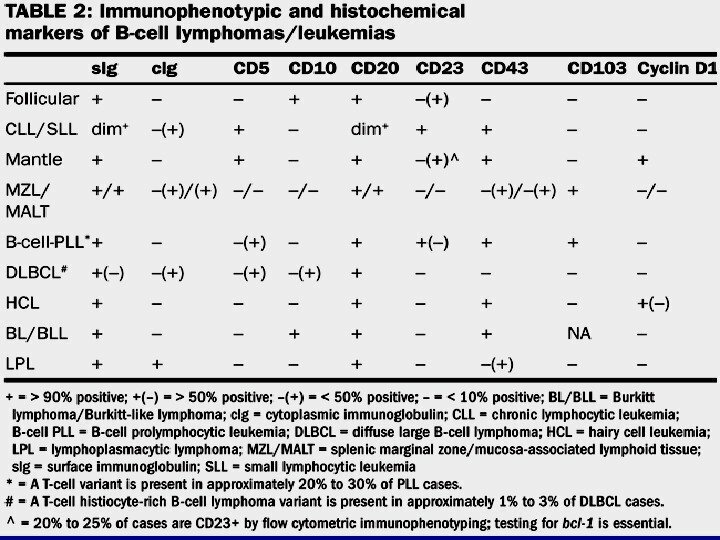 The leukemic cells of BL express a mature immunophenotype that distinguishes it from precursor B-cell acute lymphoblastic leukemia (ALL). 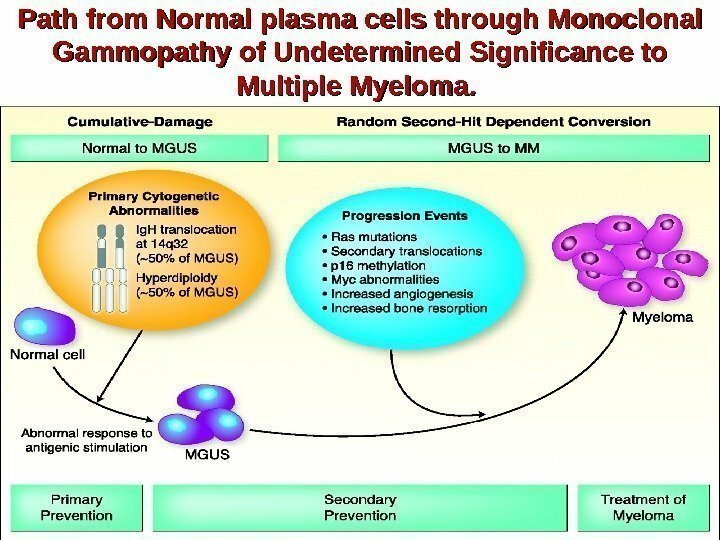 Path from Normal plasma cells through Monoclonal Gammopathy of Undetermined Significance to Multiple Myeloma. . 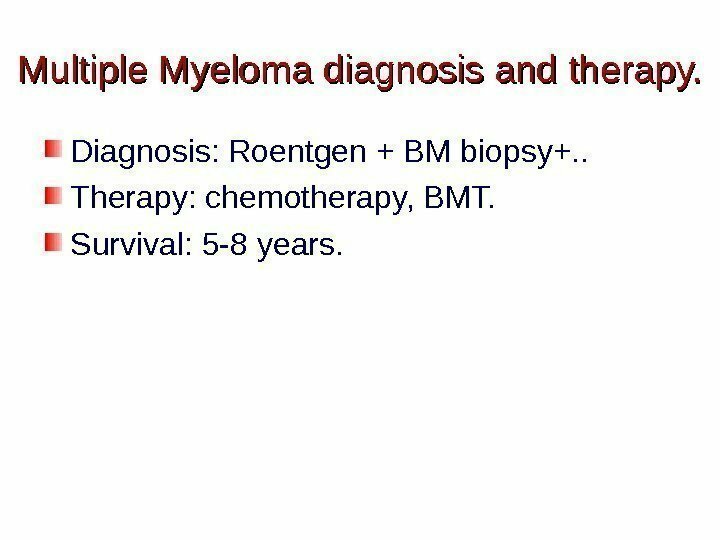 Multiple Myeloma diagnosis and therapy. Diagnosis: Roentgen + BM biopsy+. . 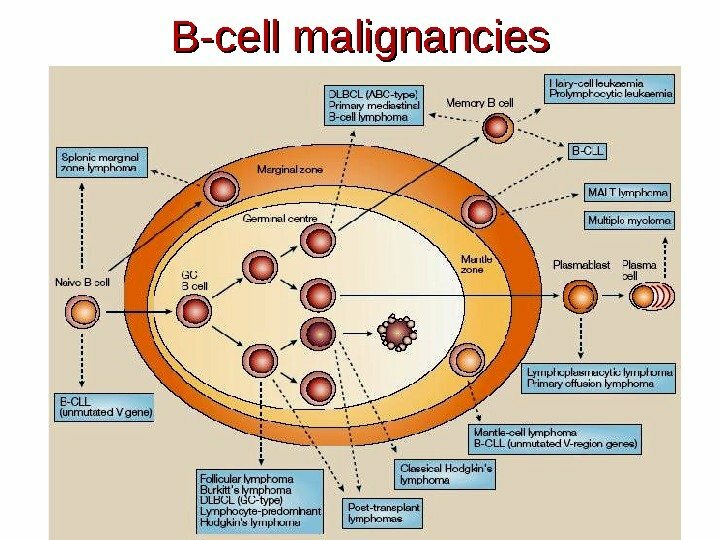 Therapy: chemotherapy, BMT. Survival: 5 -8 years. 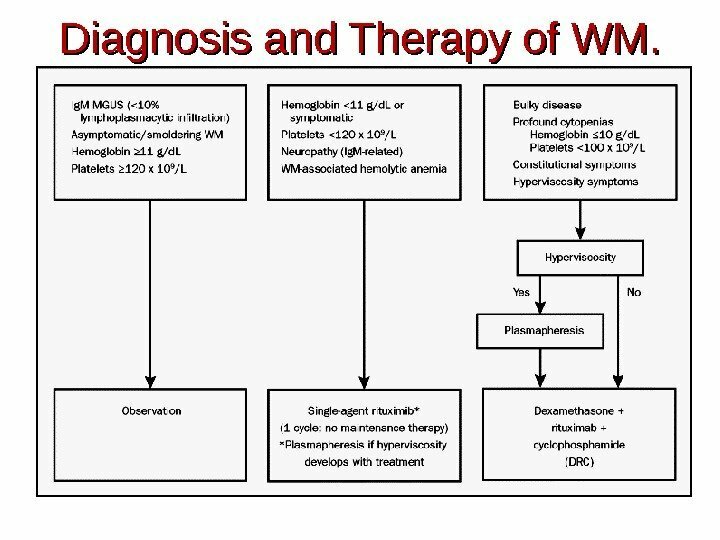 Diagnosis and Therapy of WM. 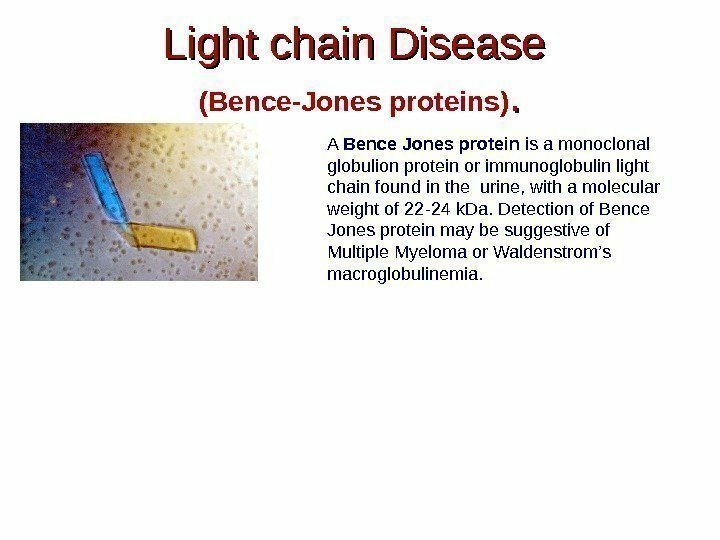 Light chain Disease (Bence-Jones proteins). . A Bence Jones protein is a monoclonal globulion protein or immunoglobulin light chain found in the urine, with a molecular weight of 22 -24 k. Da. 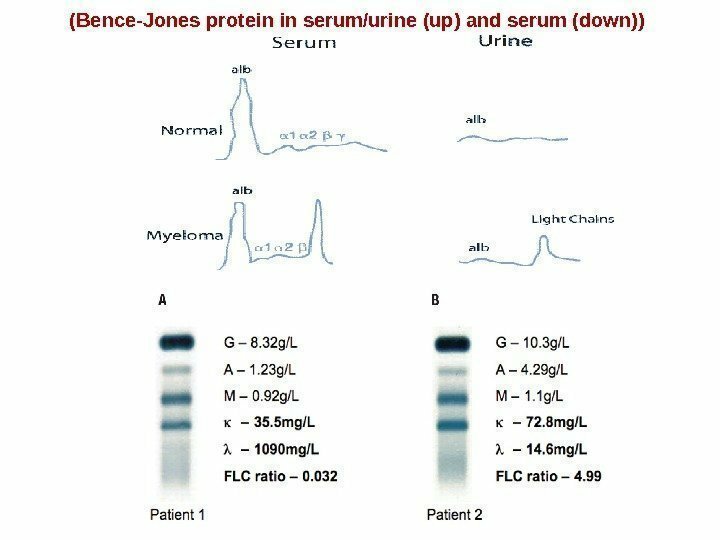 Detection of Bence Jones protein may be suggestive of Multiple Myeloma or Waldenstrom’s macroglobulinemia. 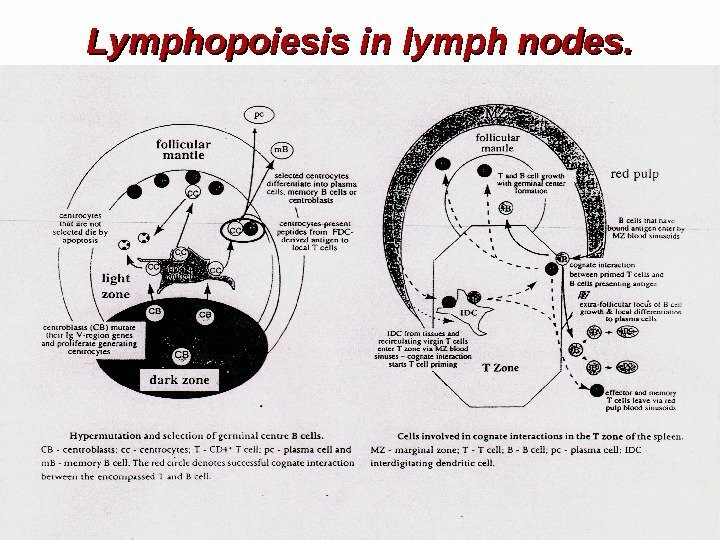 Secondary immunodeficiency in lymphoproliferative diseases. 1. 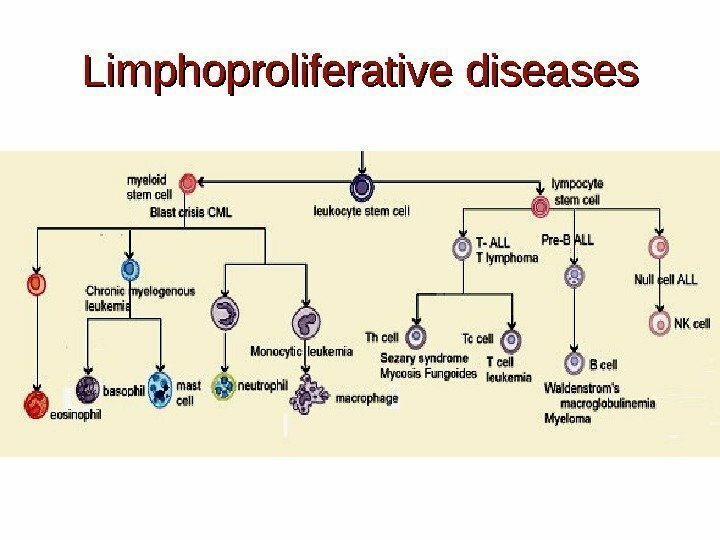 Lymphoadenopathy (decreased lymphocyte proliferation to mitogens, T cell subpopulation imbalance). 2. 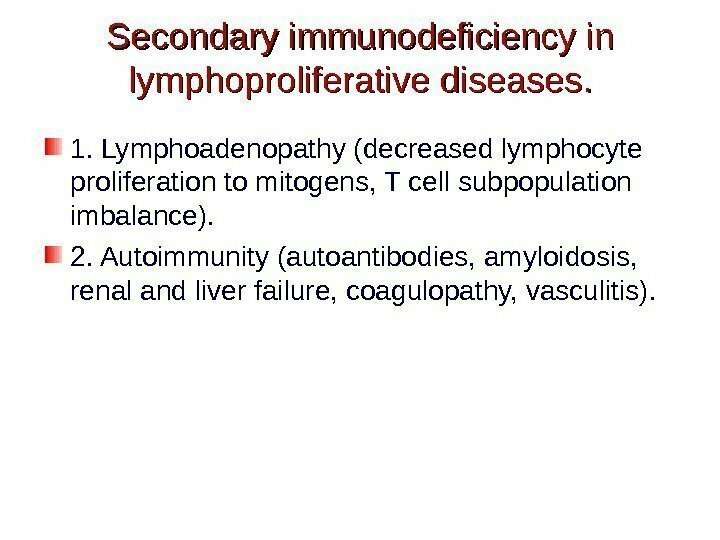 Autoimmunity (autoantibodies, amyloidosis, renal and liver failure, coagulopathy, vasculitis).